Efficient filtration is a key component for a clean, healthy, thriving aquarium. Typical stocking densities (in relation to water volume) of fish, plants, corals and invertebrates far exceed levels one would ever find in nature. The biological waste products emitted by aquarium inhabitants must be effectively removed and metabolized before they become toxic. Aquarium filters are available in various configurations and should provide mechanical, biological and chemical filtration, as well as oxygenation. An essential form of filtration, it involves the removal of particulate waste from the water. Most filter media serve to mechanically filter the water to some degree. Mechanical filter media, which is very fine (like polyester), will trap greater quantities of debris and plug more rapidly. To properly exploit the advantages of mechanical filtration, regularly remove accumulated debris. This will help support superior oxygen levels, stable water conditions and reduce nitrate accumulations. The active control and change of specific water characteristics. Filter media and various products exist that remove chlorine, eliminate medications after disease treatments, neutralize heavy metal ions and effect changes in hardness and pH levels. This form of filtration is particularly useful when the characteristics of source water are known (easily achieved through the use of basic test kits). Specific chemical filter media should be used to optimize water conditions for various groups of fish and plants. Biological Filtration Biological purification of water is accomplished by various beneficial strains of bacteria. There are several important sources of waste produced in most aquariums. Fish generate nitrogenous waste as they breathe and excrete organic matter. Plants shed leaves as they grow. Invertebrates and corals also shed organic substances. Beneficial bacteria known as Nitrosomonasand Nitrobacter, commonly referred to as nitrifying bacteria, prefer lodging in the filter system. Superior oxygen levels exist due to constant incoming water, while biological filter media provide an excellent habitat for these desirable bacteria. Nitrifying bacteria utilize two very toxic nitrogenous compounds, ammonia and nitrite, as an energy source, and produce nitrate, a relatively harmless by-product. Nitrate is easily controlled through regular water changes and is used by plants as a food source. 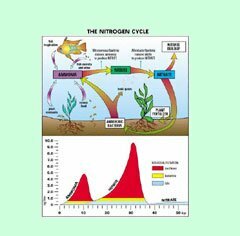 The Nitrogen Cycle (see chart) refers to the conversion of toxic nitrogenous compounds, ammonia and nitrite to nitrate. This phenomena is commonly encountered when first starting an aquarium, or if certain events take place which eliminate or reduce beneficial nitrifying bacteria, such as disease treatments or prolonged power failures. Bacteria take time to establish themselves. Nitrifying bacteria reproduce every eight hours. The initial nitrifying bacteria to populate tend to be Nitrosomonas, which convert ammonia to nitrite. This takes approximately ten days. The levels of ammonia during this stage are often toxic and fish populations should consist of a few very hardy species. Additional water changes are recommended, always ensuring that pH levels are not increased (to avoid increasing the toxic ammonia component, NH3). The use of Cycle is highly recommended to introduce significant quantities of ideal bacterial strains, critical for rapid biological establishment and purification. The second group of nitrifying bacteria to populate are those of Nitrobacter, which convert nitrite to nitrate. This period takes up to approximately twenty-one days, after which nitrite should be almost gone. During this phase, it is highly beneficial to perform additional partial water changes. Nitrite is also a very toxic compound. When present in high enough concentrations, it is lethal and can affect the red blood cells of fish. Should nitrite levels persist for more than twenty-one days, additional partial water changes should be performed, along with supplemental doses of Cycle. 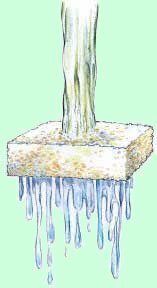 It is important to understand that water chemistry, temperature, pollutants and other factors can affect the performance of nitrifying bacteria. Maintaining stable temperature, pH and water quality is important for all tank inhabitants, even for those that are invisible to the human eye, specifically, bacteria. Although ammonia and nitrite readings may be zero, after approximately one month, the aquarium has not reached full biological stability. Avoid overfeeding (2 feedings daily, amount consumed in 2 min.). Regular testing of Ammonia, Nitrite, & pH. Stock the aquarium slowly (over a 3 to 4 month period). Regular removal of organic debris (dead plant leaves, etc.). Use Aqua Plus with all water changes (eliminates toxic elements and reduces stress). Regular dosage of Cycle (builds and maintains superior biological filtration). The aquarium is a closed system, unlike many natural bodies of water which receive constant fresh water from environmental processes. Aquarists should include regular filter maintenance, partial water changes and regular supplementation of optimal bacteria to ensure superior water quality. Cycle incorporates 12 strains of bacteria at extremely high concentrations to provide aquariums with unique advantages. Inoculating the aquarium with nature�s most efficient strains of beneficial bacteria on a weekly basis will not only benefit water quality, but also promote the dominance of these particular strains. One of the additional advantages is a concept termed competitive exclusion, a situation where the most abundant bacteria prevent the establishment of other strains, some of which can be responsible for fish disease. The 12 strains of bacteria have been carefully selected to function as a team. Some are responsible for breaking down organic waste from fish and plants, and some convert the resulting byproducts to harmless compounds that are recycled by plants and diluted through regular partial water changes. This process takes place at the water surface, the interface between water and air. The most efficient way to increase oxygen levels in water is to move and agitate the surface (without causing stress to aquarium inhabitants). The greater the surface movement, the greater the oxygenation rate. Symptoms of oxygen deficiency sometimes occur in heavily stocked aquariums and are demonstrated by fish exhibiting exaggerated and rapid gill movement. It is important to note that temperature is also a factor. Higher temperatures result in lower dissolved oxygen levels. 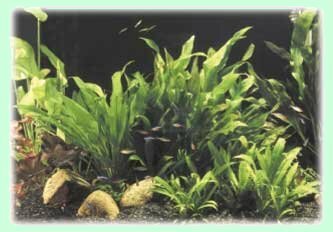 Planted aquariums should employ gentle surface movement. This will reduce carbon dioxide loss, a key element of photosynthesis for plants. AquaFizzzz Airstones - create air bubbles, water movement and may be used for ornamental purposes. Power filters and powerheads are much more efficient in oxygenation versus air pumps, because of greater water movement over a much larger water surface area.